Artist's rendering of a Mars opposition, when the Red Planet and the sun sit on exact opposite sides of the Earth. Distances are not to scale. Mars will make a close approach to Earth Saturday (March 3), and interested skywatchers can follow the action live online. Every 26 months, the orbits of Earth and Mars align such that the two planets form a relatively straight line with the sun. This cosmic event is called an opposition, because the Red Planet sits on the exact opposite side of Earth from the sun. Mars will be in opposition to Earth Saturday, and it will be visible even to stargazers under the cloudiest of skies. That's because the online Slooh Space Camera will broadcast a free, real-time feed of the Mars opposition, beginning at 11:00 p.m. EST (0400 GMT on March 4). Mars shines brightly at opposition this week in the interesting constellation of Leo. The Red Planet's oval orbit also dictates that some oppositions bring it much closer to Earth than others. 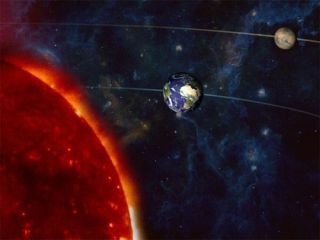 Saturday's opposition isn't one of the closer ones, because it occurs when Mars is near aphelion, or the farthest it gets from the sun during an orbit. The Mars opposition of 2003, on the other hand, occurred when the Red Planet was near perihelion, or its closest distance to the sun. During that approach, Mars came within about 34.8 million miles (56 million kilometers) of our planet — the closest the two planets have been in nearly 60,000 years. Skywatchers who want to observe the Mars opposition the old-fashioned way can find the Red Planet in the constellation Leo on Saturday. Mars will rise in the east at about the same time the sun sets in the west. This sky map of the Mars opposition shows how the Red Planet will appear in the night sky. Mars will outshine all the stars in Leo; it should be readily visible to the naked eye as an unblinking pale red dot. With a decent telescope, skywatchers should be able to see the Red Planet's ice caps and perhaps some other surface features. This isn't the first time that the Slooh Space Camera has broadcast live views of cosmic events. Last month, for example, the online skywatching service webcast a live look at a rare triple conjunction that brought Venus, Jupiter and the moon close together in the night sky.